Of course, the best way to plan a beach wedding is to hold them on the beach, but if you are not able to do that, there are other ways to put a tropical mood into your wedding day. From the decorations to the menu to the music, putting together a beach wedding is really fun and easy to do. A beach wedding begins with a great invitation. Maybe you can include a palm tree design or a hibiscus flower to indicate Hawaiian leis. Or, maybe the wedding invitation can be shaped like a surfboard for the less formal wedding celebration. Some bridal couples like to include a pinch of sand in the invitation for a surprise to their guests. Of course, you could always have sea shell(s) glued to the front of the invitation or use a shell design. Whatever strikes you as beach related, can be used for your invitation. After you've set the laid back mood for your beach wedding, then you can further the theme with a little tropical dress during the ceremony. If you're on a beach, then you can go barefoot or wear floppies or even low cut sneakers under your full wedding dress. Many beach weddings use 4 - 6 foot tall lighted tiki torches to create the aisle for the wedding processional. Make sure the torches are spread at least 7 feet apart/across from each other. (found at Wal-mart's, Michael's, etc.) or you can set large sea shells to create the path, as well. CALL ME AT: (727) 8871-9900. Some weddings have the bride in a lovely Hawaiian dress and the groom in shorts and an island shirt. The male attendants can also wear shorts with a different color / pattern than the groom. Those colors / patterns can then match with what ever the female attendants are wearing. Also, there is the option of even having all your guests wear island clothes with the immediate family members wearing leis. Be sure to consider where the sun will be shining when setting up the ceremony location. Consider providing hand-held fans and/or parasols for your guests, especially the elderly ones. Unfortunately, most times the chairs are at outdoor weddings are set up directly in the sun without any shade...and this can be quite miserable for your guests. Consider their comfort and they will appreciate it. Have cold water available for your guests, if possible. FOR MORE INFORMATION: Rev. Ronald Turcot 727-871-9900. Be prepared if you think the weather will turn cold. Tell your guests to bring coats or wraps.....especially at beach weddings. If the marine layer comes in, it can be quite cold. Warn your guests to wear comfortable shoes if there is a walk of any distance to the wedding site. If applicable, have sunscreen and insect repellent available for your guests. WARNING! Be prepared for rain. If you don't have a "PLAN B" for inclement weather, you are playing russian roulette with your wedding ceremony. The reception is the perfect place to showcase your beach themed wedding. If you are so inclined, to create a luau atmosphere, complete with a pig roast. This can be a fun way to have a more laid back reception. To add to that, you can also have dancers and island music to further set the mood. Perhaps, you can have a limbo contest for the guests at the reception as well. Beach weddings are fun and magical. These type of weddings can capture the beauty of warm breezes and newly commited love. They are popular in Florida. FOR MORE INFORMATION CALL: Rev. Turcot at (727) 871-9900. Although there are plenty of summer weddings, there can be a great advantage to being a September or October bride. The fall season takes the beauty of nature and puts it into your wedding for a warm and inviting feel. And since weddings are traditionally performed in the Spring and Summer, you may also find a deal on having yours in the fall. Fall weddings are as abundant as the harvest, so let's talk about them now. The first of many fall wedding ideas is to incorporate nature into your wedding. This is an idea for the outdoorsy couple that likes to be in the woods or among falling leaves. Have your ceremony outside during the day. Perhaps , you may elect to have your wedding inside, so the location site may be decorated in warm fall colors to resemble the outside. Then, after the ceremony, you can have your photographs taken at a local park, or botanical garden to capture the season. Another idea is to dress your bridesmaids in a color that reflects the season. A deep burgundy can be very pretty on most tones and colorings. Or you might want to try a nice green. It can be a great change from the traditional pastels and blacks. A nice purple is another good option. Your reception can also incorporate your Fall wedding. Perhaps, you might want to decorate with pumpkins or artificial leaves on your table. Your centerpiece could be a carved pumpkin with a candle inside. It will give off a subtle light and still provide that Fall touch. With the extra money that you save, you may be able to go on a very warm honeymoon. The Spring Season is not the most popular season of the year, in fact it's a distant third place behind summer and the autumn. This could be "good news" if you're planning a Spring wedding, as more top-notch vendors will be available, and you may be able to get discounted rates, especially on sites (venue location) and travel. If your getting married in a church, talk to them about their Easter decorations. You may very well be able to save money by using theirs. Vendors and sites may be more available in the Spring than in the summer, but remember that's also when you may be competing with "proms." It's advisable to consider booking limousines and tuxedos extra early. YOU MAKE A MISTAKE WHEN SAYING YOUR VOWS! Smile, take a deep breath & laugh-- It's fine to give yourself a few seconds to regain composure - and pick up where you left off. (Your Officiant will coax you along) Everyone will consider it charming. Speak up immediately and be very specific about what you don't like. Usually, it's just a part of the style that the Bride is unhappy with, not the entire look. It's far easier to rework the front of an updo, for example, than redoing the whole thing from scratch, so you need to be clear. To prevent this problem from the onset, schedule a trial run a month before the wedding. If there is a long-standing feud within the family, maybe a cousin / uncle problem or two sisters who are not speaking, you have to decide whether to invite both, one, or neither. Although a wedding may seem like an ideal opportunity to rebuild some emotional bridges, this is not the occasion for you to play peacemaker. Let the relevant parties know that you would like both to attend if they can be civil and avoid causing a scene. If they can't promise you that, then don't feel guilty about leaving them off the guest list. Frankly, if they can't put their own issues to one side for your big day, do you really want them there anyway? However, it doesn't hurt to be mindful of sensitive situations. The seating plan is where the best-laid plans tend to come unraveled, so invest some time in making sure that you not only seat guests with people they know but that you don't put a lot of loud or attention-seeking people together who may clash. CALL Rev. Turcot at: (727) 871-9900. Learn to say no (nicely) if family members start imposing their ideas. Do things your way, not your mom's or his dad's or the grand-parent's. The modern wedding has moved forward light-years beyond the time your parents and grand-parents got married, and innovation has as much a place at your ceremony and reception as tradition. Try not to fall out with anyone, but be firm about whose day it is. If you start giving in at the outset to keep people happy, by the time you are a few months down the line, your wedding may not resemble anything you wanted at all. Most advice that you are offered will be well-meant if a little misguided at times. At least act as if you are considering the options, and if you can think of a good reason why you are declining a suggestion or an offer of help, use it. Phrases like " You must be joking" or " I wouldn't be seen dead doing that" can easily offend. Older relatives may roll their eyes in horror, but there is nothing written anywhere that says a bridal couple has to have a best man or attendants (bridal party), particularly for a small civil ceremony or for a service in a tiny chapel. The best man can also be a woman, a teenage son, a nephew, or even twin brothers playing a dual role. If the bride is "given away," the "donor" does not have to be an elderly gentleman, either, for a bride who has lost her father. It can be very touching for the bride to ask her mother to walk down the aisle with her instead. For generations who grew up with a fixed format for weddings, having a barbecue instead of a formal sit-down reception or cocktails and hors d'oeuvres after the church ceremony may seem unusual, but it is your choice. Brides , too, are increasingly choosing to give a little speech, so if you want to have your say, have it. CALL: (727) 871-9900. Your wedding is over and now you are thinking about how do I save my wedding cake until my first anniversary? Well that's a very good question. First, Ask a close family member or a very responsible person to take the top layer home. This layer should be placed into the freezer immediately, to harden the icing. In one to two hours, the cake should be frozen. Take the cake and loosely wrap it in Saran Wrap (nothing else works) at least seven (7) times and then place it in a cake box. Then put the cake box in two freezer bags (tightly wrapped) and put in the freezer. This method will preserve the taste and texture of the cake. NEVER keep the cake in a frost-free freezer, bacause the constant defrosting will draw the moisture out of the wedding cake. When you are ready to eat your cake on your anniversary, just remove the cake from the freezer and THAW in the refrigerator for 48 hours, then place at room temperature for two to three hours. The cake will be beautiful and tasty as the day of your wedding. Be sure and get competitive quotes and let your potential vendors know that you are comparison shopping. This sends the signal that you are serious about doing your research and looking for the best rates. FOR MORE INFORMATION: (727) 871-9900. Even if your research checks out, if your instincts gives you a negative feeling about this vendor, look elsewhere. The most common forms of wedding rip-offs aren't the dramatic no-shows, but rather the substitutions that often happen at the last minute. Luckily, these are the easiest problems to protect yourself from. Make sure that you have chosen acceptable substitutions that are specified in writing. Carefully check for hidden costs, such as set-up fees for the waitstaff, cake-cutting fees, clean-up charges. All need to be specified in a contract and countersigned by your vendors. Bring a three-ring binder containing all your contracts and receipts to the wedding and keep it in a safe place. Should any of your vendors not stick to any agreed services, you will have everything you need to carry on an informed discussion. Many "encore" brides (encore = previously married) wonder if they should wear white. The answer is, if the bride wants to wear white, she can! While society tends to associate "white" with viginity, it does not in tradition represent virginity any more. The beauty of marrying a second + time is you don't have to wear white if you don't want to. This holds true for a first time bride as well, but many feel they must wear white. CAUTION: "Encore" brides should never wear a veil as society STILL regards this as definitely only for virgins. Instead, wear a gorgeous tiara or elegeant hair updo. IDEA # 1.) Are you looking for a unique alternative to "ringing bells, or clinking glasses," etc. at your wedding reception? Announce to your guests that in order for you to kiss, they must stand up and tell a story, or share a memory, about either you or your Groom, or about you as a couple. Then get ready to reminsce, to laugh, and to brush away tears. Your guests will be kept entertained and you'll have so many more special memories of your big day to look back upon. IDEA #2.) Assign someone to snap pictures of guests as they arrive at the reception using an "instant camera." After the wedding reception, sign each photo, add your wedding date, and include a short word of thanks to each guest for having attended. Mail the photos to the guests along with your thank - you cards as an extra memento. IDEA #3.) Have REAL doves released around you as you step out of the church or ceremony location creating a true fairy tale effect. Your guests will never forget it! Neither will you. Check your local Yellow Pages for companies offering this service. IDEA #4.) Make your wedding day really special....Ask your mom, grandmother, or a special aunt to be your Matron of Honor. Who better to honor on the single most important day of your life? IDEA #5.) Can't come up with a really unique gift for your Flower Girl? What little girl wouldn't love a Bridal Barbie Doll? All the magic of your wedding day is certain to capture her imagination and keep her mesmerized. You can bet she'll spend hours reliving it over and over again in the fantasy world of Barbie. This is one gift that is sure to be both cherished and well used. DECLARING YOUR WEDDING SETTING TO BE A SACRED PLACE! On your wedding day, regardless of where you are, that setting can simply be declared to be a sacred space for your wedding. Invoking "Divine Presence" is a matter of intention and faith in God. His spirit will be with you. Don't take anything for granted. 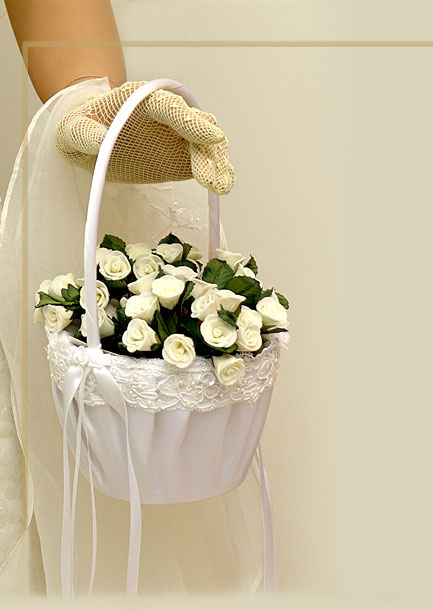 You'll probably need to arrange the details, such as flowers and pew or end of row / aisle decorations yourself. Ask to be sure! Inquire up front about any restrictions on (for church use) photography and music, as well as what the fees are for cleaning up and parking attendants. Ask if you can have your own Officiant or must you use their Officiant? I personally do not have photographer restrictions! Only one! Don't embarrass the bride! Otherwise, i really don't have any requirements! Tell him he can use "FLASH" anywhere. As long as he / she doesn't get between the Officiant and the bridal couple, everything will be just fine. Many church pastors have a "fit" when a photographer uses his flash attachment during the wedding, especially on or near their altar. Some pastors will even ban the photographer from using a camera at all. Actually, there is NO canon law that mentions anything about photography. When canon laws were created, there was no such thing as a photographer. When a pastor halts the use of "flash" he's just stating his /her own preferences. Sadly, many churches actively engage in a medieval belief that earthly things will destroy the holy character of a sacred place such as a church sanctuary. Absolute nonsense! Based on this pagan belief, they prohibit the use of cameras during a wedding ceremony. How does the bride get any pictures of her wedding if a church prevents the taking of pictures? It is absolutely ridiculous for anyone to prevent the recording of a wedding and ruin a bridal couple's big day. Be sure to ask the pastor what restrictions he may have concerning the use of a photographer / videographer in his church or synagogue. FOR INFORMATION: Call Rev. Ronald Turcot at (727) 871-9900. IMPORTANT TIPS FOR A STREES-FREE WEDDING DAY! In spite of all the planning that you put into your wedding day, when the day actually arrives, it can still be a whirlwind of pressure and last minute decisions. Even the calmest of brides can become stressed under these circumstances. Here are some tips to guarantee you won't be one of them. Think about holding your ceremony later in the day. Getting ready for a 5:00 PM service is much less stressful than trying to get down the aisle by 11:00 AM. Designate a go-to-person for last minute decisions and make sure that your vendors know that this is the person with whom they should coordinate everything with on the wedding day. This could be the mother of the bride, a trusted friend, or even someone that you hire. Choose someone who is decisive, assertive, dependable and detail-oriented, and make sure you fill them in on exactly what you want so that they can make informed decisions. Allow extra time for everything. Hair and nails always take longer than planned and the photgrapher always wants just one more getting ready photo prior to the ceremony. Have a detailed day -of-wedding timeline -- - not just for the bride, but for everyone involved. Distribute copies to vendors and the wedding party members ahead of time. As you plan your wedding day, designate a wedding day item box and place everything you'll need for the big day in it. And, make a list as you add things to the box. That way, on the day of your wedding, you'll need only to grab the box and go. HINT: review the list a few days before with your mom or your maid of honor to be sure you haven't forgotten anything. Have a bridal emergency kit on hand for last minute glitches. you can purchase one or put together your own. Be sure that you have signed contracts from ALL your vendors, so there will be no last-minute surprises. Be wary of the vendor who does not require a deposit or a signed contract for their services. There is a higher likelihood that a colossal error might be made. (like your flowers or your D.J. don't show!) if things are not in writing. Let go of rigidity. Even if you have planned every aspect of your wedding day down to the minutest detail, there will always be last minute changes. You'll have a much better day if you go with the flow when weather forces your outdoor wedding inside, your bridesmaid sprains her ankle, or an extra guest or two shows up. Plan to be totally ready 30 minutes prior to the ceremony. Use this time to sit and breathe! You'll be the picture of serenity when you walk down the aisle.